Fans of German soccer will recognize that this horse, like his stablemate and last year's controversial Breeders' Cup Classic winner Bayern, is named after a team in the Bundesliga. Owner Kaleem Shah is a fan - and given the success his German-flavored horses have had, you can be sure these won't be the only ones. There are, after all, 18 teams in the Bundesliga. As good as Bayern is, though, Shah may never see a horse as good as this one - no matter what he names them. Dortmund has, in his young career, established himself as a superfreak. 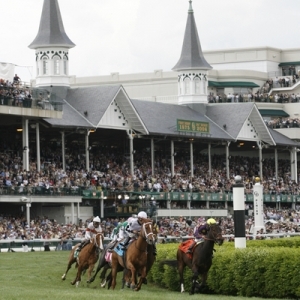 He is the +450 favorite to win the Kentucky Derby in early betting action on Sportsbook.ag. Santa Anita Derby: There have been a lot of very impressive efforts in prep races this year so far - Carpe Diem in the Blue Grass, Firing Line in the Sunland Derby, Mubtaahij in Dubai, and so on. None, though, were as impressive in my eyes as what Dortmund did in California's biggest race for three year olds. The field was deep and solid, but Dortmund was a man among boys. He stumbled out of the gate - and, according to trainer Bob Baffert, lost a front shoe at that time - but settled down quickly and took the lead from his inside post position. He settled there, slowed the early pace slightly, and was never really threatened. Once the field rounded the final turn, though, something clicked and the race was over. Dortmund pulled away and won easily but did so without looking like he was exerting any effort at all. It was as professional and impressive as any horse can look in winning a big race against a good field - never mind a young horse racing this early in the year. He seemed like a freak before this race. Now he confirmed it. Prior experience: Dortmund didn't make his debut until the day after the Breeders' Cup at Santa Anita. He has made up for lost time nicely, though. He has raced six times and hasn't lost yet. That debut win was solid. With an eye on the future, he was shipped across the country to Churchill Downs for his next race to get a taste of the Kentucky Derby track. Any concerns about that surface were eliminated - he was a very dominant winner. From there it was back to California for three workmanlike wins against strong fields before this real statement. He's shown real versatility in his running style - he has won on the lead or fought from behind. He's faced adversity and fought back, passing horses that have passed him. He's a pro. Most significantly, he has never yet felt like he is accessing his full potential - or even close to it. This is a special horse - in a field this year that looks to have three or four of them. Trainer: Bob Baffert knows a thing or two about winning Triple Crown races - he has won the Kentucky Derby three times, the Preakness five times, and one Belmont. His last Derby win was back in 2002, though, and he hasn't won one of the big ones since the 2010 Preakness, so he has had some bad luck - like in 2012 when he finished second in all three races. As much Triple Crown success as he has had, though, he has never had a group of horses like this. Dortmund and two-year-old champion American Pharoah both have the potential to be great, and One Lucky Dane is fast developing and is a real threat, too. It's a loaded stable for the trainer who, for my money, is as good as there is right now. Jockey: Martin Garcia has the mount on this horse, and it would take a truly monumental development for that to change. Baffert trusts him, and they have won a whole lot together - including the Breeders' Cup Classic last year with Bayern. Garcia was also aboard for Baffert's last Triple Crown win - the 2010 Preakness with Lookin at Lucky. Garcia has never won the Derby, but he and Baffert did win the Kentucky Oaks in 2011, so he has had success at Churchill Downs on big days. He has been aboard for all six wins by this horse, so he obviously is a fit with him. Breeding: As a son of Big Brown - who was a ridiculous freak himself - we know that Dortmund has some good Classic blood in him. Big Brown, of course, dominated in the Derby and Preakness before completely misfiring in the Belmont in one of the more mystifying and frustrating no-shows in recent racing history. His damsire, though, is Tale of the Cat, who established himself on the track and in the breeding shed as somewhat more of a sprinter than a long-distance horse. That's a minor concern, but the horse certainly hasn't shown any hints of distance issues so far, and I am not going to worry about it too much.